Choosing Christmas presents for men is something I always struggle with. Finding presents that are useful, that they might actually like AND that are light and easy to post to Australia makes it even more difficult. Socks might fit the brief however there are only so many pairs of socks any man would want. Having decided to make as many presents as I could this year, the hot water bottle cover designed by Emma of Simple Pleasures Sewing was a perfect choice for my hard-to-buy-for male relatives. Hottie covers are light, unbreakable, soft, practical (well, perhaps not in summer but come winter time and it will be their best friend) and, most importantly, easy to personalise. The mechanic in the family is getting this great vintage car blueprints hottie cover (It’s ok. He never reads my blog so it is safe to show it here). The cover is lined in the teal Flurry spot that you can see behind the hottie cover. As well as this indigo colour way, the outer fabric comes in other great manly colours of charcoal and black and also a fabulous vintage planes design. 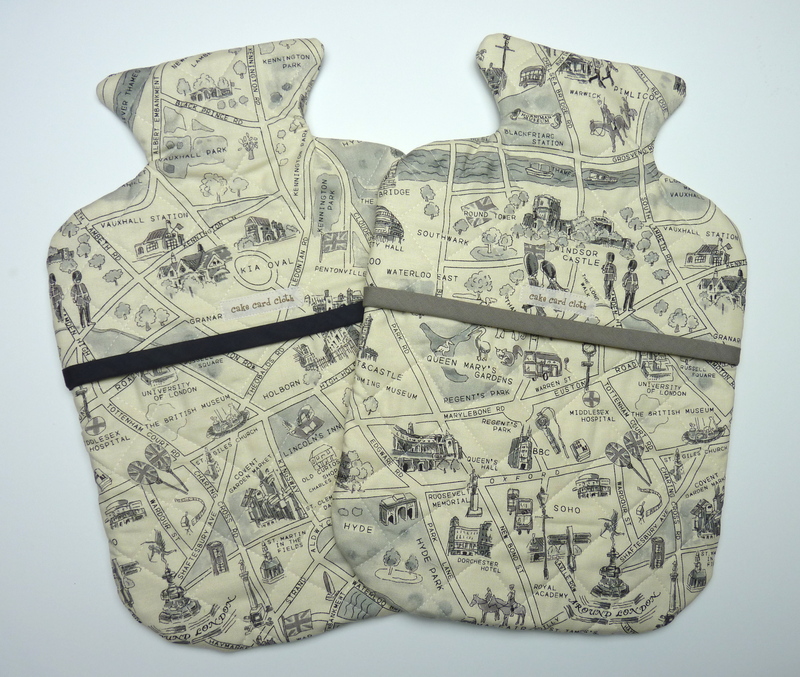 Whilst the teenage boys will be finding hottie covers made in this gorgeous London maps fabric under the tree. I love this map fabric (Passport by 3 Sisters for Moda). It is like a giant i-spy game and comes in coloured versions too. Being teenagers however I thought the masculine grey tones looked more grown up and would suit them better. 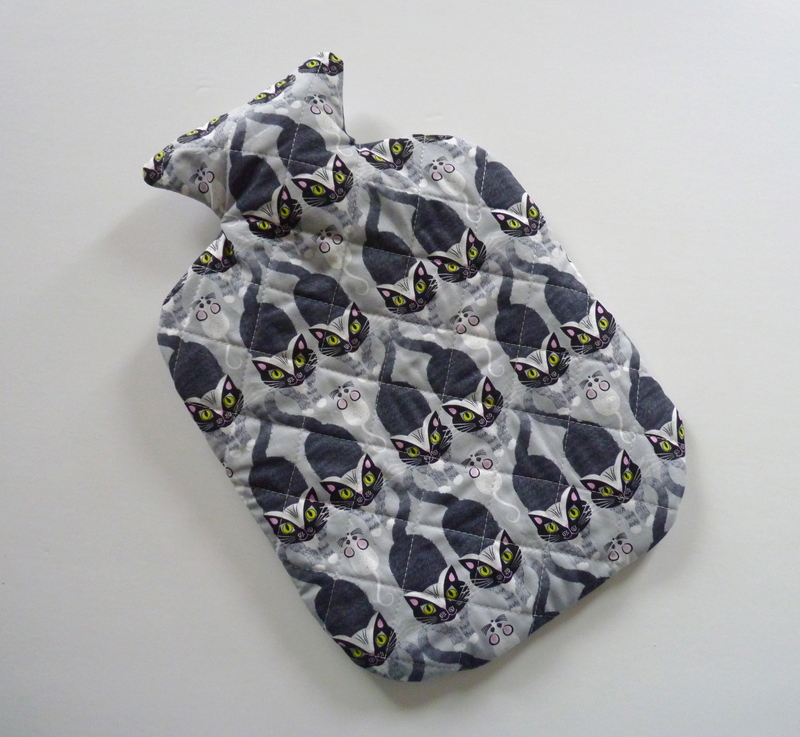 Their hottie covers are lined in a co-ordinating grey spotted Flurry fabric, making the inside just as fabulous, and all hottie covers are machine quilted to make them extra cosy. 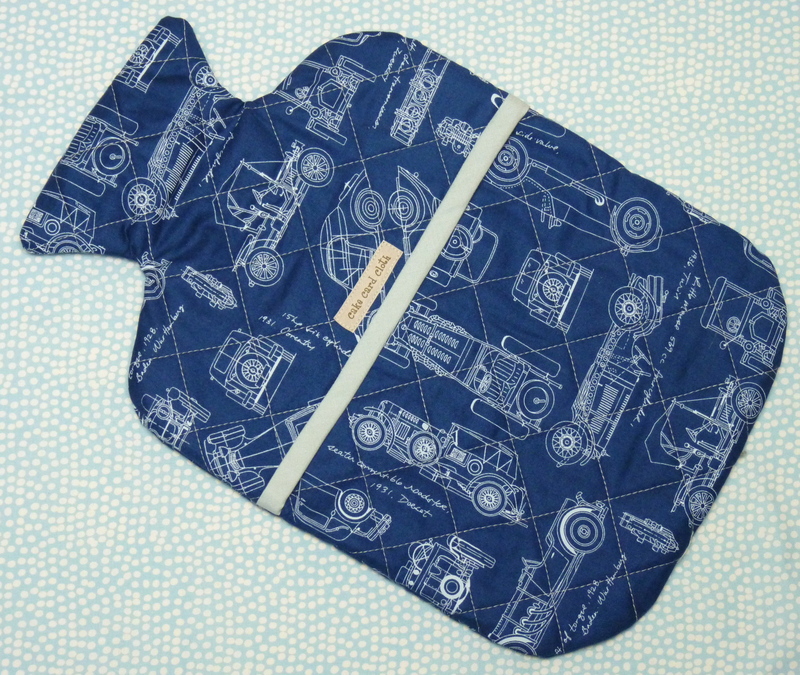 I’ve loved making these hot water bottle covers and know that the men who receive them will also love them. A win-win situation all round. What do you do when it is cold and grey outside? For me, I like to sew, particularly if I am making something that will be cosy and warm. 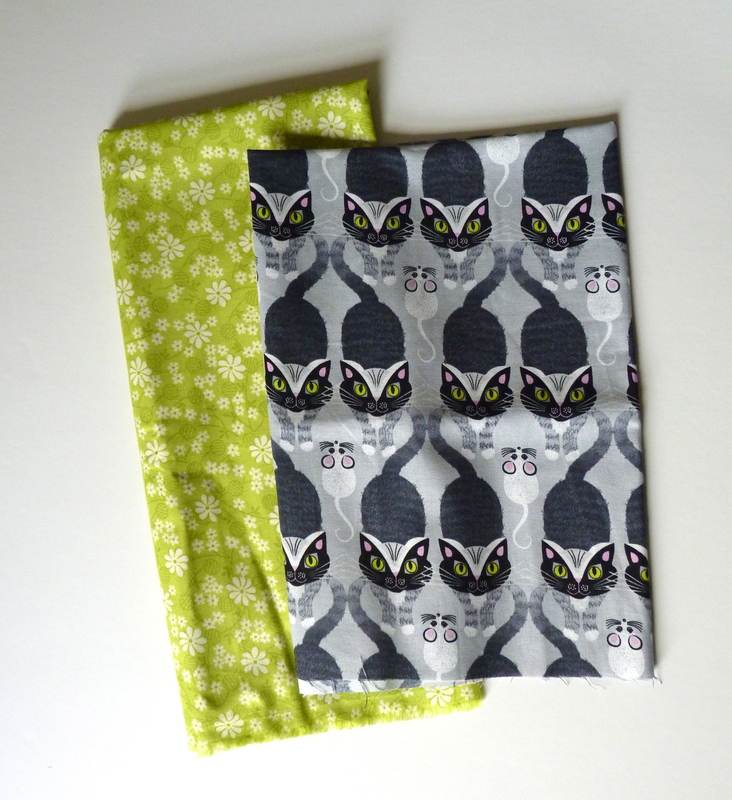 I had picked out these fabrics some time ago thinking that they would be perfect to make into a hot water bottle cover. The gorgeous green is one from the Miss Kate collection by Bonnie and Camille (Moda) whilst the statement Cat and Mouse fabric is from Timeless Treasures. And here is the finished item, whipped up on the weekend. A lovely hottie cover perfect for a friend who loves cats (obviously!) and who has two black and white cats of her own. 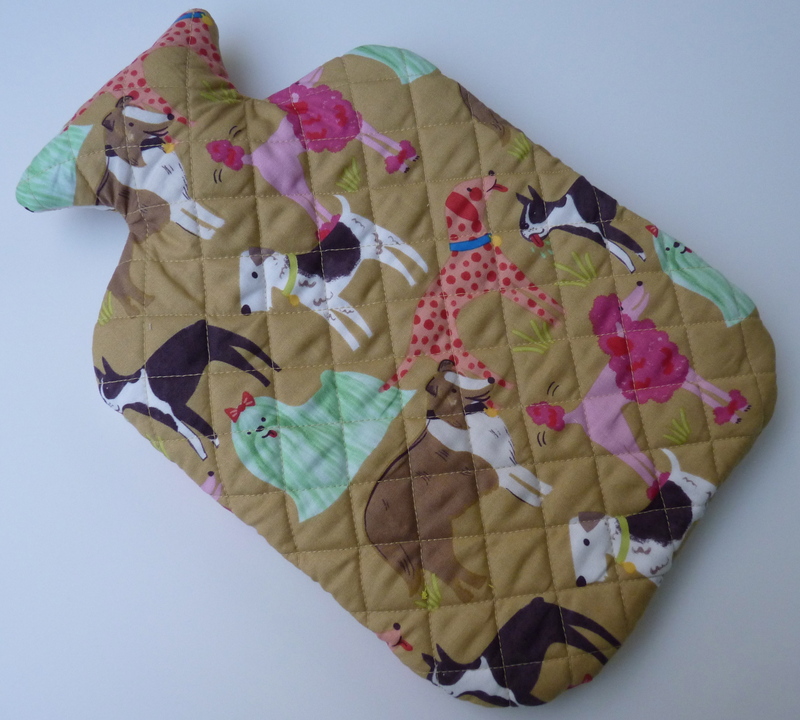 As usual, I took the time to pattern match the design – mis-matched tails and paws would not sit right with me – and machine quilted the cover with an all-over diagonal pattern. Kona solid in charcoal was used for the bias binding whilst the green fabric is the secret surprise (who doesn’t love those?) on the inside. And it is beautifully soft and warm, being made from 100% cotton. My friend loved her hottie cover and will use it every day. It’s the perfect gift to warm the body and the heart. Last week I was busy making some hot water bottle covers that were a custom order destined as presents for some special people. 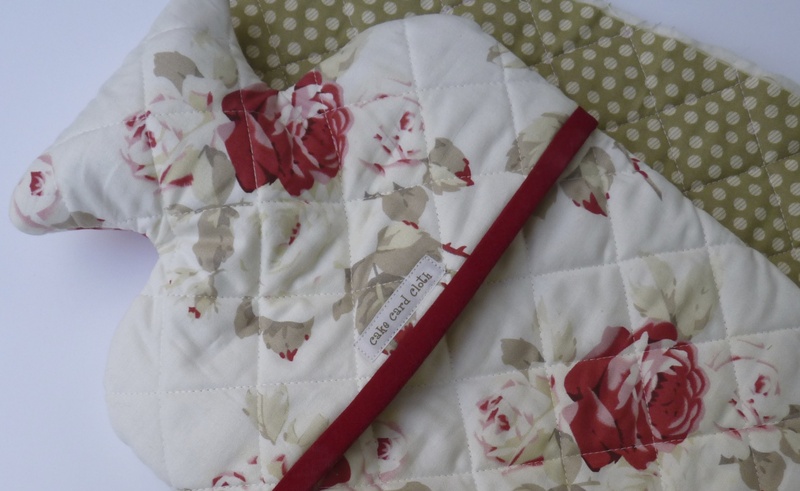 Firstly, I was asked to make a hot water bottle cover suitable for a 13 year old girl. It could not be too pink or overly girly as the recipient is a bit of a tomboy. 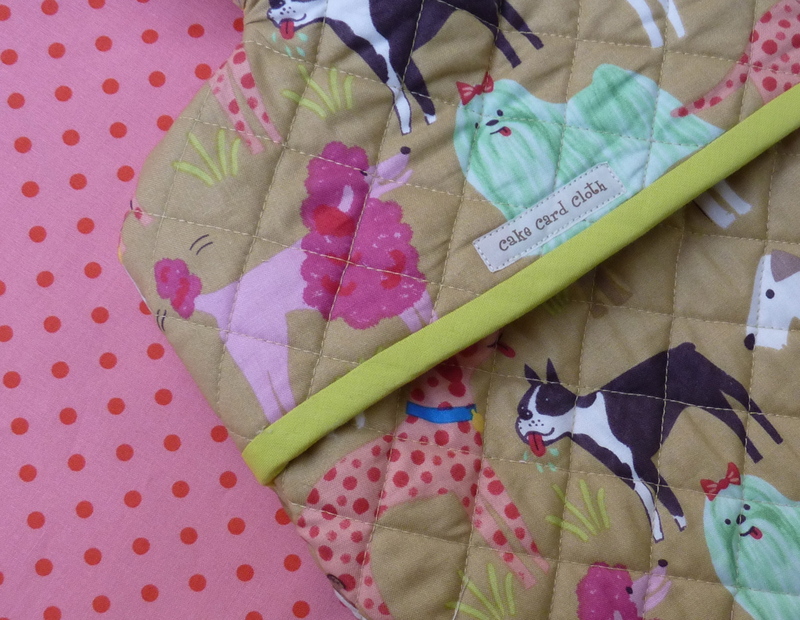 This quirky dog fabric from the Best in Show collection by Maude Asbury fitted the brief perfectly. It is so cute! There is also a cat design in this collection if that is more to your taste. A pinky-peach toned spot fabric (shown as the background) was used for the lining and I used Kona solid in Cactus for the binding. The spots were a great choice in another unexpected way. Their fortuitous alignment meant that I could easily quilt the fabric by simply joining up the dots. The second cover was for someone who I was told would live in The White Company if they could. For the outer cover I chose the white large rose fabric from the Petal collection (sadly now discontinued) by Tanya Whelan. The lining is a sage green spot fabric and I chose a deep red solid for the binding. In this case, I couldn’t take the easy option of just joining the dots when quilting as these spots were irregular. Instead I drew lines on the fabric with a water soluble pen and used these as a quilting guide. Some might think it a waste to use such lovely fabrics for the lining, especially when it is not on show. I disagree. To me it is a secret surprise only seen when the cover is opened for filling. It is that little extra that makes it more luxurious and a bit special. When making the covers I used Emma’s fabulous instructions as previously. The only change I made was to quilt the fabric as a block first and then cut the pieces, rather than quilting the pieces individually. I found a block of fabric easier to manipulate on the sewing machine and there was the added bonus that the quilting lines on the pieces matched beautifully (yay!). 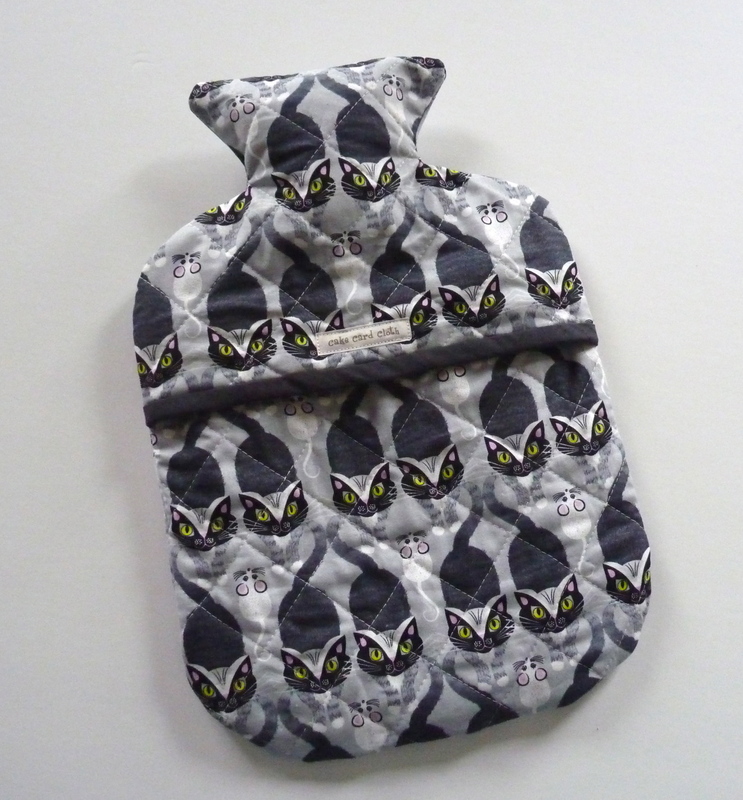 Hot water bottle covers make a great gift for people of all ages and at any time of year. Pick colours and fabrics that you know they will love and you will be giving a gift they will treasure. 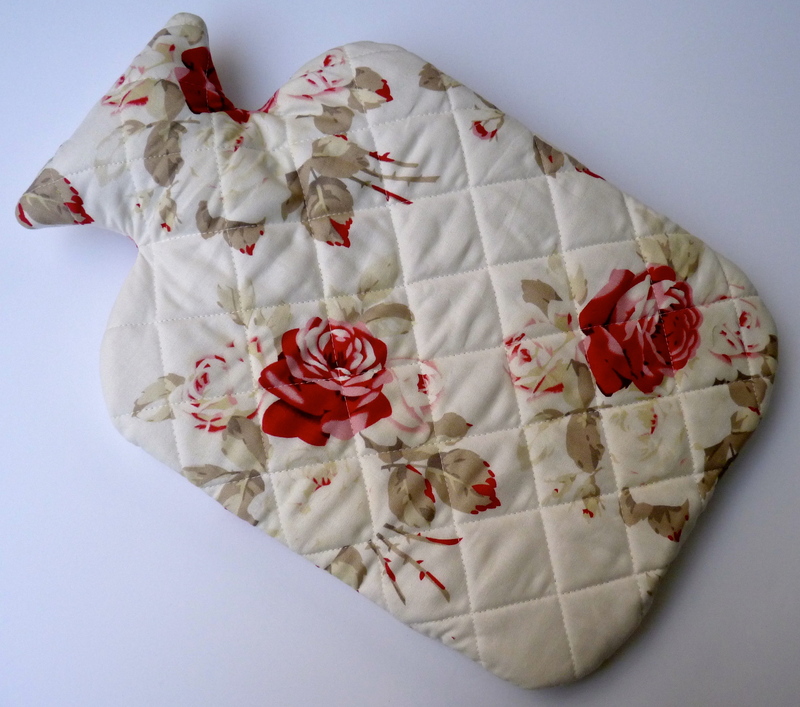 Do get in touch if you’d like to order a customised hot water bottle cover as a gift for yourself or for someone special. I’d love to help you make the perfect present. Another fabulous class with the lovely Emma from Simple Pleasures Sewing School. My task this time was to make a hot water bottle cover. I love Emma’s pattern with its neat, tapered neck. 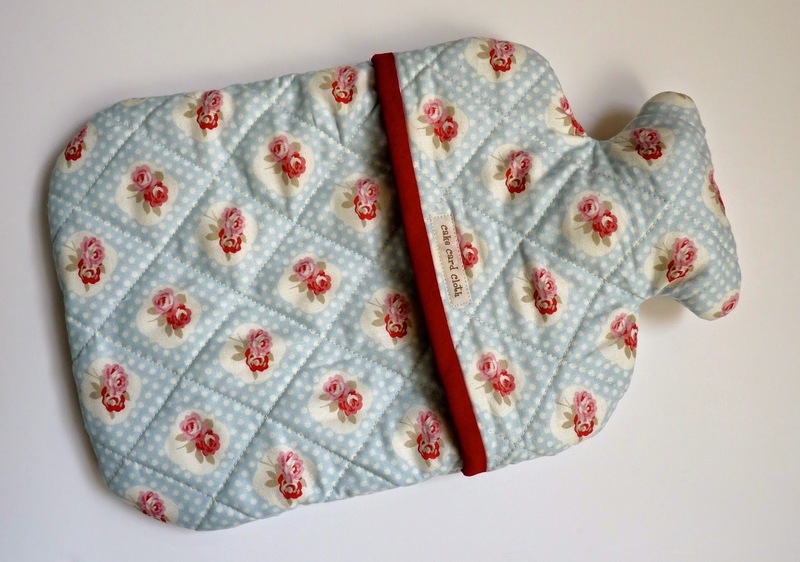 This one is lined with a matching blue spotted fabric and is well padded and quilted to make it soft and cosy. It already has a new home as it was delivered today to a very special niece for her birthday. And because it was her birthday I also made her some lamingtons. 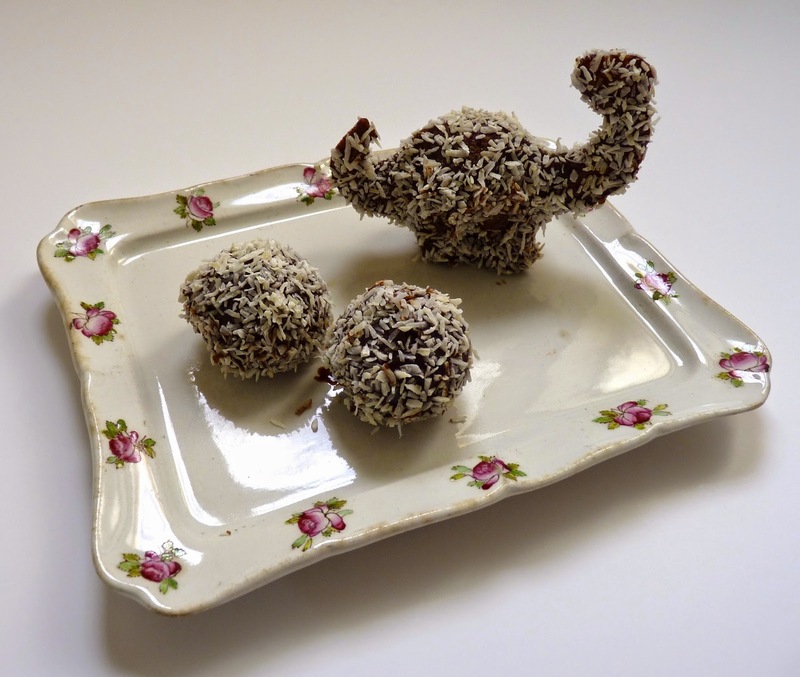 For those not in the know, lamingtons are a favourite cake in Australia. They are made from vanilla sponge, usually cut into squares, which are dripped in chocolate icing and then covered in shredded coconut. Just for a change, I experimented with some cake pop and dinosaur moulds from Lakeland to use as the base for my lamingtons. Sadly, only one dinosaur emerged intact (a result of me not filling the mould completely) however I think he looks pretty cute with his chocolate coating. I have christened this one a lamisaurus. My niece certainly liked him, although not as much as she loves her new hottie.